Yesterday, Samsung has launched their flagships for the year 2015, but there are two- Galaxy S6 and Galaxy S6 Edge. And the Indian e-commerce site Flipkart has already published a dedicated page for pre-order of these two handsets. The phone sports 5.1-inch SuperAMOLED screen (1440x2560p resolution), with that Galaxy S6 Edge became the smartphone with the highest pixel density in the world. The phone is powered by Samsung’s very own 64-bit 2.1GHz octa-core Exynos 7 processor and Sammy claim s that it will make Galaxy S6 35% faster than its predecessors. Samsung has also moved from DDR3 RAM to DDR4 RAM and placed that it Galaxy S6 Edge which is claimed to boost RAM by 80%. so, we can see much faster app switching without any lag. In case of storage, both the Galaxy S6 and Galaxy S6 Edge will come with three options- 32GB, 64GB and 128GB. See also: Samsung launches Galaxy S6 Edge, really worth going for it? In case of camera there is not a very high upgrade as the phone has a 16MP lens having f1.9 aperture, however it comes with Optical Image Stabilization. But in case of front facing camera, the phone is a beast having 5MP f1.9 lens, which lets in 60% more light and thus producing much brighter and clearer photos. It also comes with a real-time HDR and mode that combines multiple images to create better images. In case of battery backup, the phone gets a huge thumbs up as Samsung has claimed that when charged for just 10 minutes, the battery will last for 4 hours, which is great. However, the battery will not be removable. Every manufacturer is now moving towards the e-commerce strategy in India. Xiaomi and OnePlus are the most successful in this case, and Samsung, which has lots its glory in the past few years is desperately trying to get back into the market with the e-commerce strategy. So, hurry and pre-order your Samsung Galaxy S6 and S6 edge from Flipkart. 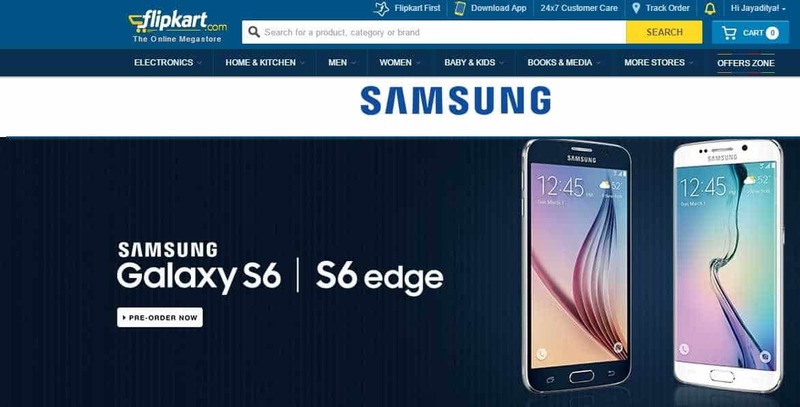 You can also check out the dedicated page for Samsung Galaxy S6 and galaxy S6 Edge on Flipkart to know more about the features and technical specification they have described.